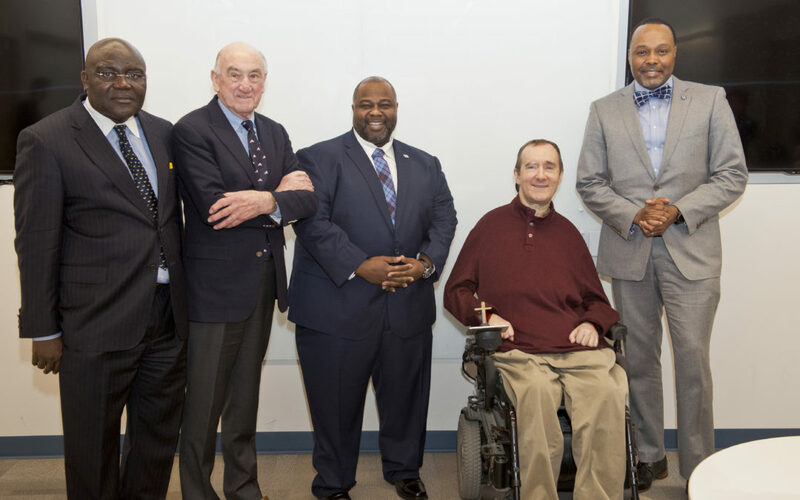 The University of Delaware’s Cybersecurity Initiative hosted a discussion with James Collins, Chief Information Officer of the State of Delaware, and Solomon Adote, Chief Security Officer of the State of Delaware, on Feb. 15, 2019. Collins and Adote met with UD students and faculty experts in cybersecurity to share the state’s strategies for information security, discuss the ongoing threat of cybercrime and brainstorm solutions to continually protect the personal information of Delawareans. The discussion took place in UD’s iSuite — a facility in Evans Hall that houses a “live-fire” virtual environment for cyber-warfare training, thanks in part to state support. Collins praised students for studying cybersecurity — an important part of the innovation economy and society at large. “A lot of times when folks think of war, battle and conflicts, they think of bullets, missiles and guns, but I would suggest to you that in the future, the enemies will be virtual, and the frontlines will be digital, and those that are in the cybersecurity field will be on that frontline for our nation, our state, and for our neighbors and friends, so I’m just going to congratulate you for stepping into that role,” he said. Collins also talked about the role of high-speed connectivity, information technology centralization, and data analytics in delivering government services and resources to Delawareans digitally. Adote noted that the information security program in the State of Delaware has been very strong for years and explained ongoing efforts to keep information secure, including education for citizens and state employees; policies, standards and compliance; disaster recovery; identification; cloud security; threat detection and response, and network security. With strong government and industry collaborations, international research partnerships and a variety of educational programs in cybersecurity, the UD Cybersecurity Initiative is well equipped to partner with the State of Delaware and contribute to efforts in blockchain, smart cities and more emerging areas of importance. “At UD, we are ready to tackle both traditional and non-traditional cybersecurity issues,” said Nii O. Attoh-Okine, interim academic director of UD’s Cybersecurity Initiative, in opening remarks. The National Security Agency and the Department of Homeland Security designated the University of Delaware a National Center of Academic Excellence in Cyber Defense Education (CAE-CDE) in 2016. The five-year designation is based on the university meeting stringent CAE criteria and mapping curricula to a core set of cyber defense knowledge units.